Ctenocallis setosa apterae are unmistakable given their numerous long finger-like papillae (small rounded protuberances) protruding from the dorsum. Adult apterae (see first picture below) are yellowish, but with the yellow ground colour of the dorsum more or less obscured by brownish segmental bars which extend from near the mid-line to the body margins. There is a complete segmental series of long, finger-like papillae on the spinal and marginal regions of the body segments. The marginal series is complete from the pronotum to the seventh abdominal tergite, with one papilla on each side per segment. That of the sixth abdominal segment is shorter than the rest and the siphuncular pore opens at its base anteriorly. The spinal series is complete from the head to the eighth abdominal segment inclusive. The cauda has a slightly elongate knob, bearing about 14 hairs, and the subanal plate is fairly deeply cleft. 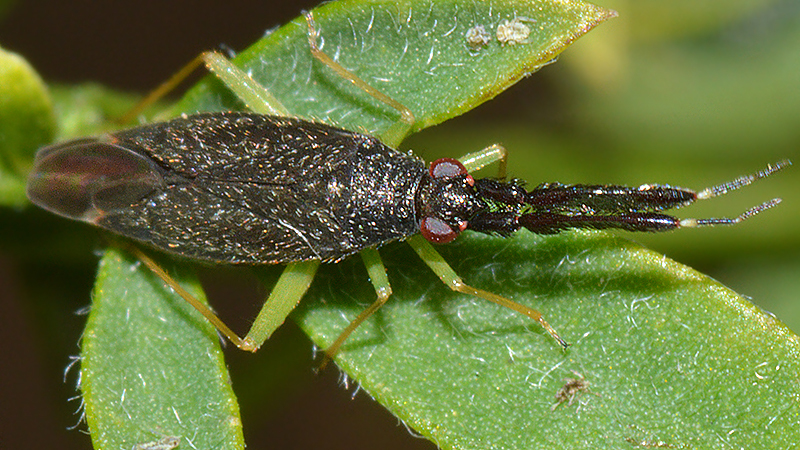 The body length of the adult aptera is only 1-5-1.6 mm. 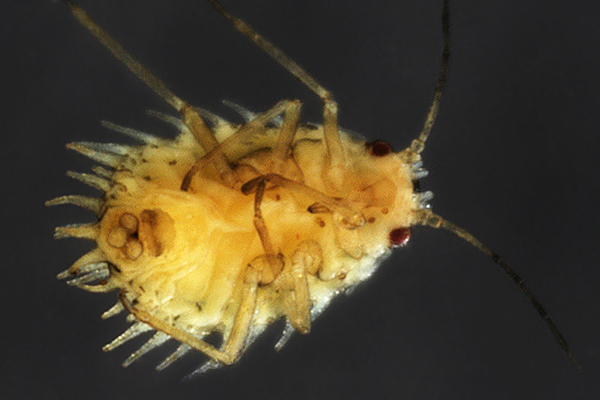 The dorsal view of an aptera (see first picture below) shows the papillae on the front of the head. The second picture below is a ventral view and shows the trifid appearance of the cauda and subanal plate. 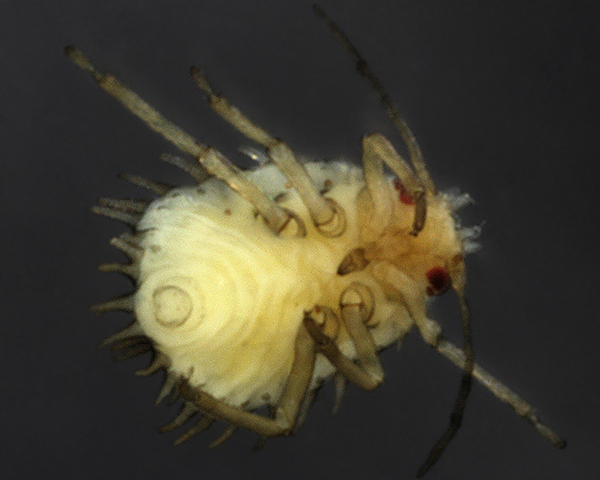 An immature aptera, shown ventrally below, can be readily distinguished from a mature aptera. The alate (see picture below) has the papillae much reduced in size and the siphuncular pores are more or less apical on short, blunt spinulose processes. The wing membrane is rather densely and finely spinulose-imbricate, and the radial sector is absent, its support function being performed by the strongly recurved first branch of the median vein. Ctenocallis setosa feeds flattened against the midribs on the upper sides of leaves of broom Cytisus scoparius. Its colour, small size and irregular profile make it very difficult to see - especially on the older, often blotchy leaves. It is widely distributed in Europe, and has been introduced to North America, but is generally rare. 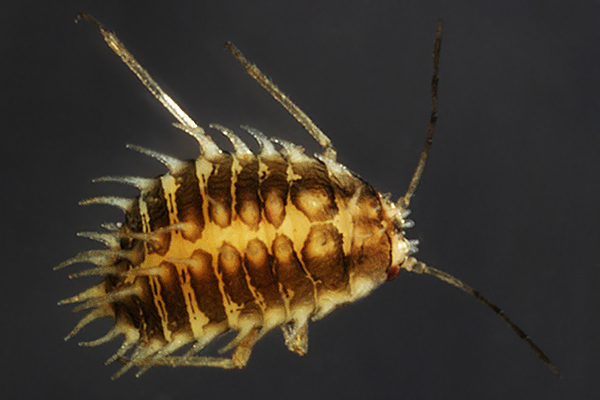 Our observations are the second record of Ctenocallis setosa in UK to date. Stroyan (1957) was the first to record this species in Britain, which he described as "very inconspicuous sitting chiefly on the upperside of the leaflets, and to a lesser extent on the stems of broom". We first found Ctenocallis setosa in late July on young broom bushes growing in Pinus forestry plots at Bedgebury, Kent. 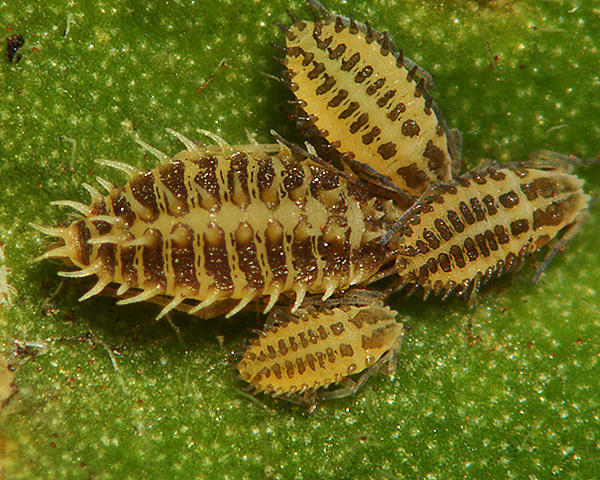 Several leaves had immature nymphs scattered on them (see picture below). Alatae were also present on some of the leaflets. 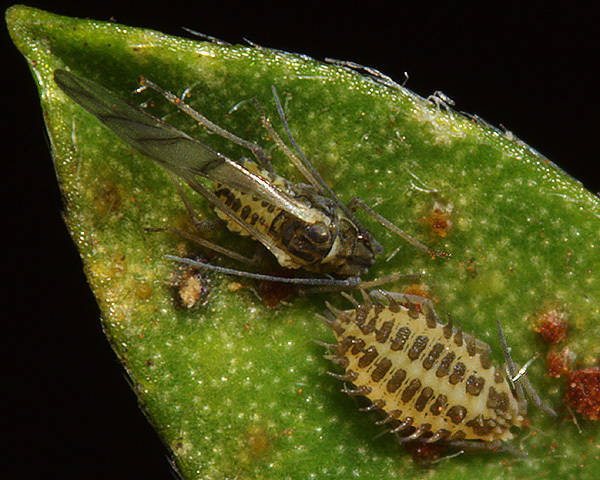 An alate and an immature aptera are shown in the picture below. 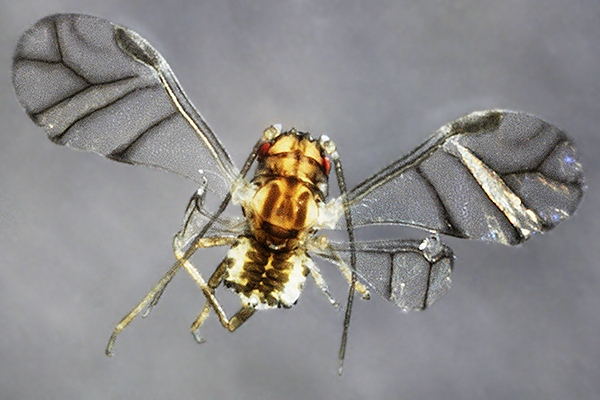 A dorsal view of a mature aptera is shown below. A very few aphids (but no alatae) were found on subsequent visits in August, which suggested that numbers had peaked in June-July. 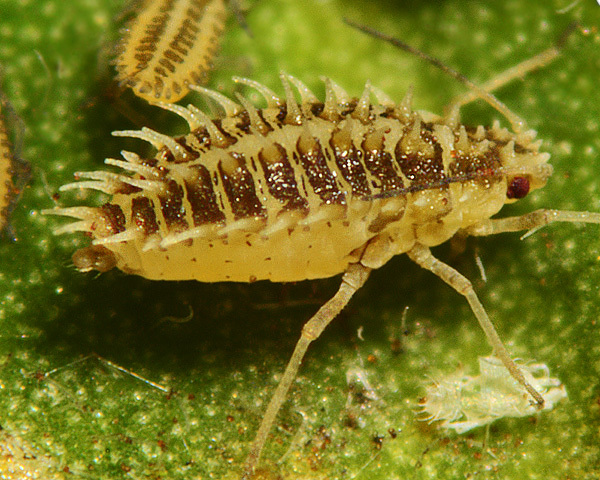 The species produces oviparae and alate males in September. Halaj & Osiadacz (2014) have done a brief review of the genus in their paper on the first record of Ctenocallis israelica in Central Europe. They note that the three Ctenocallis species are not associated with particular species of Cytisus (of which there are about 60) but instead with three zoogeographic areas: Mediterranean (Ctenocallis israelica); Pannonian or Eastern European (Ctenocallis dobrovljanskyi) and Atlantic-Central European (Ctenocallis setosa). All are relatively rare on a global scale. The most noticeable features of Ctenocallis setosa are the numerous long finger-like papillae protruding from the dorsum. These structures presumably evolved to provide disruptive camouflage. 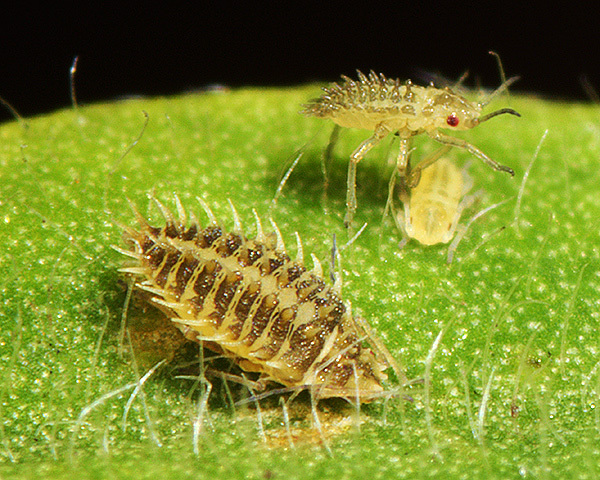 The conspicuous elements disrupt the predators' search-image and break up the aphids body outline, making detecting this prey difficult. Endler (2006) describes how different camouflage elements (crypsis, disruptive elements and mimicry) can be combined. Crypsis is combined with disruptive camouflage by Ctenocallis by matching with the colour of senescing broom leaves. 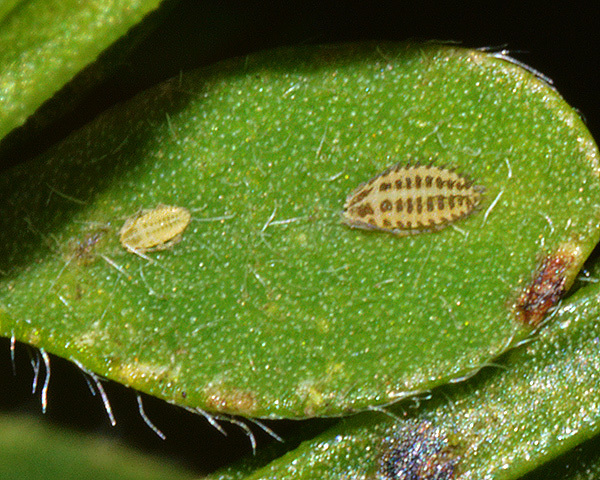 Two aphid predators were present on the broom leaves. 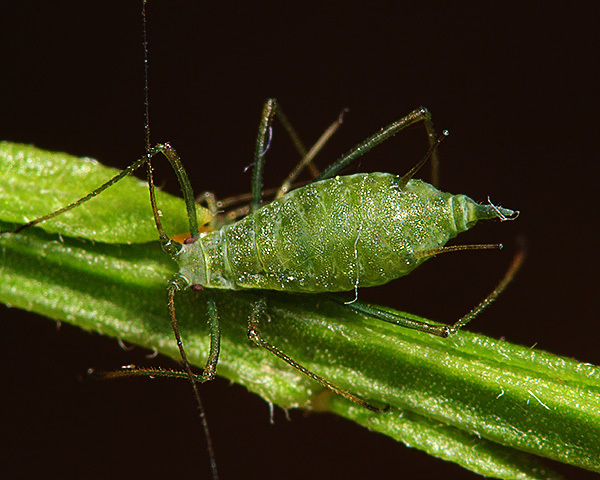 The first was Heterotoma planicornis, a predatory mirid bug. The antennae, having a broad and flattened second antennal segment, are especially noticeable. 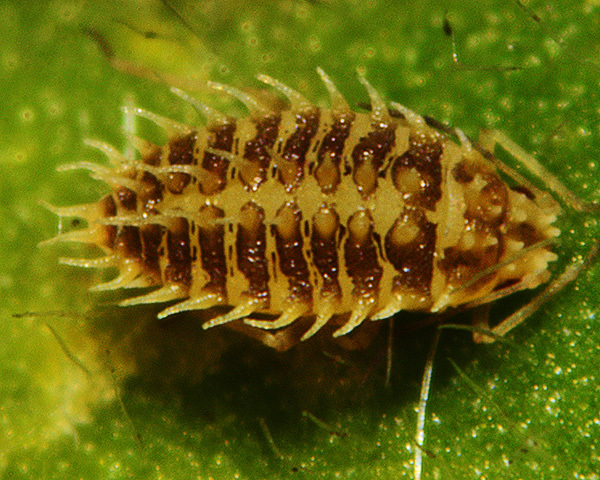 The bug feeds on aphids and other small arthropods, as well as on over-ripe fruit. 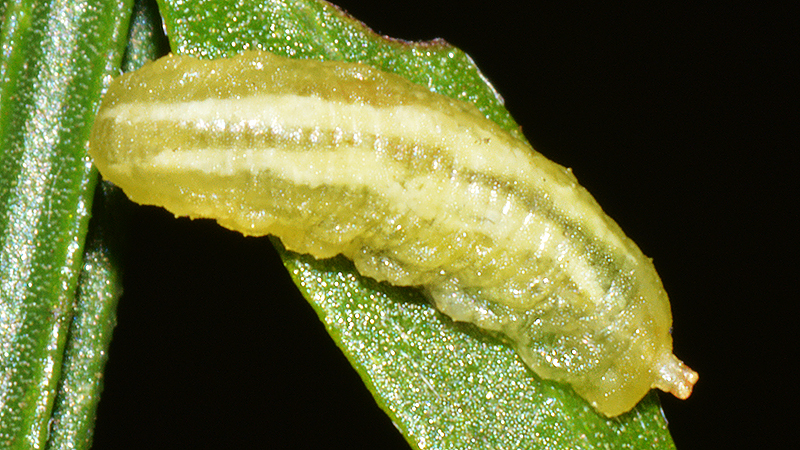 The second predator was a syrphid larva, of the genus Sphaerophoria, distinguished by the two lines of pale fat lying below the cuticle. Since we had two species of aphid living on the broom (see below), there was no way to tell which prey each of the predators was feeding on. 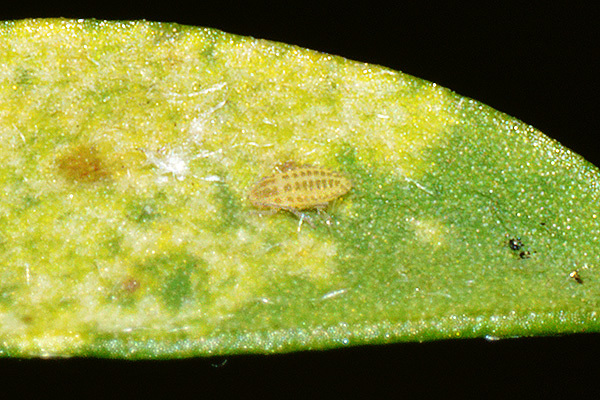 Blackman & Eastop list about 14 species of aphids as feeding on broom worldwide, and provides formal identification keys for aphids on Cytisus. Of the 9 species on common broom (Cytisus scoparius), Baker (2015) lists 8 as occurring in Britain: Acyrthosiphon caraganae ssp occidentale, Acyrthosiphon pisum, Aphis craccivora, Aphis cytisorum ssp. sarothamni, Aulacorthum solani, Ctenocallis setosa, Myzus persicae, Neomyzus circumflexus. 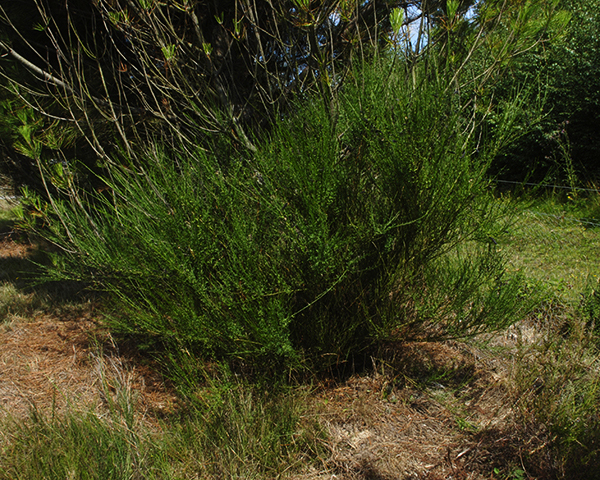 At Bedgebury Pinetum we found Acyrthosiphon pisum (see picture below) occupying the same host plants as Ctenocallis.